In 2015, world leaders agreed to the Sustainable Development Goals (SDGs) that will replace the Millennium Development Goals(MDGs) and shape the next 15 years of international development. The goals are very ambitious, aiming to end poverty, improve human rights and achieve environmental sustainability (among other things) by 2030. As readers of this blog will be well aware, the SDGs are perhaps best known for their complexity, encompassing17 goals and 169 targets. To date, discussion has largely been divided between those in support of the broad,aspirational nature of the goals, and those who think the lack of prioritisation has led to a rambling agenda that hasleft no target behind. Nevertheless, this week the SDGs will be agreed to, which brings a number of questions to the fore: how much change is required to achieve the ambitious SDG agenda by 2030? Which goals are most off-track and will need to be prioritised? And what are the particular challenges that will face different regions? A new Overseas Development Institute (ODI) flagship report, Projecting progress: reaching the SDGs by 2030, attempts to answer the above questions. Using projections from leading international organisations, including the World Bank, the OECD, and the World Health Organization, the report quantifies how much the world would need to accelerate current trends in order to achieve the SDGs by 2030. To make the task more manageable, only one key target is examined for each of the 17 goals. Goals are ‘graded’, based upon how close they would come to being achieved if the current progress toward the goals were to continue to 2030. An ‘A’ grade implies that current progress is sufficient to meet the target, while ‘B’, ‘C’, ‘D’ and ‘E’ grades represent a continuum of how much faster progress would need to be. An ‘F’ grade indicates that the world is currently heading in the wrong direction – there may actually be a regression in progress toward the goal by 2030. The results of this analysis are shown in the scorecard below. Not a single goal will be met by 2030 if current trends continue. There are no A grades. This is not necessarily a bad outcome. The goals are self-consciously ambitious, and are at least partly intended to encourage extra effort beyond current levels. Three targets received a ‘B’ grade: ending extreme poverty, boosting economic growth in least developed countries (LDCs), and halting deforestation. The ‘B’ grade indicates that if current efforts continue the world will get more than halfway towards achieving the target. Nine targets received a ‘C’ to ‘E’ grade, indicating that in order to achieve them existing efforts will have to be between two to eight times greater than current trends. These goals include much of the ‘unfinished business’ of the MDGs, such as improving health and education standards across the developing world. In addition, some of the ‘new’ goals fall into this category, such as those relating to peace, partnerships and industrialisation. Five targets received an ‘F’ grade, as current progress in these areas is heading in the wrong direction. These SDGs require that the existing trajectory turn around – if it does not, the world will be further behind these targets in 2030 than it is today. These include a number of goals related to environmental issues, such as combating climate change and improving waste management, as well as reducing income inequality. In sub-Saharan Africa, although the proportion of people living in extreme poverty is set to fall by 2030, the absolute number is projected to rise due to population growth. Only two-thirds of children in sub-Saharan Africa are projected to complete secondary education by 2030, while for the rest of the world the proportion is expected to reach 90 per cent. South Asia is on track to see 350 million people escape extreme poverty, yet the region is likely to have a maternal mortality rate almost double the global target. In East Asia and the Pacific, both extreme poverty and maternal mortality are projected to fall substantially, however it is set to continue to have the most unequal economic growth in the world. Latin America and the Caribbean is projected to sustain impressive progress on pro-poor growth, but is likely to continue to suffer a high number of violent deaths – the highest of any region. The OECD is projected to continue to impose the biggest environmental impacts in per person terms. This highlights that even in the richest countries, major shifts are needed in order to achieve the SDGs, particularly in regard to addressing climate change and sustainable waste management. This analysis should not be interpreted as a predetermined outcome. Instead, it should serve as a wakeup call that if the SDGs represent ‘the future we want’, then a rapid acceleration in current progress is required to achieve these ambitious goals. Simply maintaining the status quo won’t be enough. Radical change is required. The good news is that this has happened before. In fact, many of the SDGs would be within reach by 2030 if the world could replicate the progress of some of the top performing countries over the MDG era. However, change will need to begin immediately and countries must not delay implementing the SDGs at a national level. Each additional day that the current rate of progress is just maintained will make it that much more difficult to achieve the SDGs by 2030. 2016 marks the beginning of the Sustainable Development Goals (SDGs) and national governments are grappling with how to implement them. Aid donors are also considering how they can best partner with national governments to see the goals achieved by 2030. This raises a number of important and largely unanswered questions, chief among them: how much will the ambitious SDG agenda cost, and can countries afford it? This post addresses these questions by summarising the findings of a recent Overseas Development Institute (ODI) report that calculates the cost and affordability of achieving three key SDG targets – ending extreme poverty, attaining universal primary health care, and attaining universal secondary school completion by 2030 – on a country by country basis. How much will the SDGs cost? In August 2014, an UN Intergovernmental Committee of Experts estimated the total cost of the SDGs to be “trillions of dollars a year”. While this provides an indicative global estimate, it does not directly translate into how much the SDGs will cost in each country or whether they are affordable. The ODI report sheds light on this by focusing on three key SDG targets that will rely heavily on public expenditure. The report examines developing countries that have populations over one million people and at least one per cent of their populations living in extreme poverty. The total cost for the SDG targets related to poverty, health and education is estimated to be US$148 billion a year in low income countries alone. 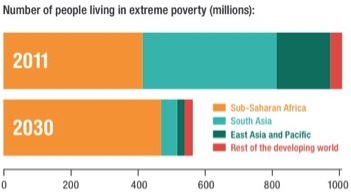 This is based upon the total poverty gap in each country, which is the amount of money required to bring all poor people above the extreme poverty line, as well as health and education costing data sourced from Chatham House and UNESCO respectively. The chart below shows the annual per person costs on a country by country basis for low and lower middle income countries. 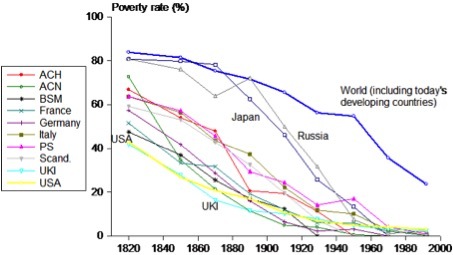 Unsurprisingly, the cost of ending poverty is highest in poorer countries (blue area). Education and health costs (green and orange areas respectively) tend to rise as countries get richer. Countries ranked by GNI per person (Atlas Method) from left to right. The underlying data for the figures included in this post is available for download here [xlsx]. To place these figures in context, in some countries, such as the Democratic Republic of Congo, the cost of reaching these SDG targets is almost as much as their GDP. This draws into question the affordability of these goals for the poorest countries in the world. Can developing countries afford them? To determine the affordability of the targets, the costs outlined above are compared to the amount of public finance (both government revenue and aid) available. In our analysis it is assumed that only public finance will be drawn on, as this is typically the case for providing cash transfers to those in extreme poverty, as well as health and education services to those currently missing out. To calculate the total level of public finance available for the three SDG targets, potential government revenue is combined with existing levels of aid. Potential government revenue is based on IMF and World Bank calculations of how much extra revenue countries could theoretically raise given their present level of development. Using potential, as opposed to actual, government revenue means that there is an onus on national governments to raise as much revenue as possible. A key assumption is that only half of potential government revenue and aid would be directed to achieving these three SDG targets. This is based on the fact that public finance is spent on a range of other sectors such as infrastructure and security. This costing exercise produces three key findings. First, almost all lower middle income countries (LMICs) can meet the costs of these three SDGs. 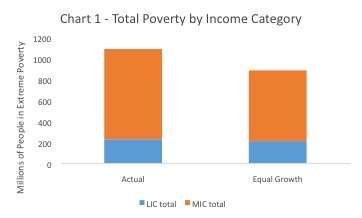 If potential government revenue is attained, aid would not be needed in most LMICs to finance these SDG targets, as can be seen in the chart below. Second, effectively all low income countries (LICs) can’t afford these three SDG targets. Relying on mobilising greater government revenue alongside existing levels of aid to LICs will not be enough. This can be seen in the chart below. Collectively the total financing gap in low income countries is over US$70 billion annually. Finally, there is enough ‘surplus’ aid in LMICs to close half the financing gap in countries that can’t afford these SDGs (largely LICs). In other words, if donors redistributed aid from LMICs to LICs, theoretically there would be enough public finance available for most countries to afford these SDG targets. These findings clearly illustrate that greater efforts are needed to assist low income countries to achieve these key SDG targets by 2030. Given that public finance will carry the burden of the costs for these targets, additional aid will have an important role to play in filling the financing gap. A key recommendation that emerges from the analysis is that donors should commit to providing at least 50 per cent of their aid budgets to least developed countries (LDCs). Currently donors only provide, on average, around 30 per cent of their aid budgets to LDCs. According to the latest OECD data, Australia gave less than a quarter of its aid budget to LDCs, ranking 24th out of 29th among DAC donors on this measure. Pope Francis famously tweeted that inequality is the root of evil. As we witnessed in Davos in January, the media can’t get enough of Oxfam’s statistic that the richest 85, 80, 62 people have the same wealth as the poorest half of the planet. In 2014, a 700-page book on inequality by a French academic was a worldwide best seller. But what exactly is this inequality everyone is talking about? It turns out that we might be measuring it all wrong. The Gini coefficient and (increasingly) the Palma Index are the most popular tools for measuring inequality within a country. These indicators calculate the ratio of the incomes of the rich over the poor. For instance, the Palma is a score calculated by dividing the share of income of the richest 10% by that of the poorest 40%. The problem with these approaches is that they only measure relative inequality. If the incomes of the poor grow as fast as those of the rich, these measures will stay the same over time, but the difference in income from a one percent growth for the poor versus a one percent growth for someone already rich can be significant. As the Italian demographer, Livi Bacci, said ‘it is not much of a relief for somebody living on $1 day to see that his income, up by three cents, is growing as much as the income of the richest quintile’. Unfortunately, relative inequality measures don’t tell us about the absolute gap in incomes between the rich and the poor. To explore the differences between absolute and relative inequality consider the example of the Philippines (see figure). Over the last 25 years, relative inequality remained fairly stable in the country. This can be seen by the fact that the red line is quite flat across the income distribution as on average all people have experienced a growth rate in their incomes of around 2% a year. However, the green line shows that the additional income generated from this growth is massively weighted towards the rich end of the income distribution – they got the lion’s share of the dollars, a fact obscured if we stick to measures of relative inequality. In other words, absolute inequality increased dramatically. Politicians, pundits, and other voices often herald the impressive economic growth of developing countries in recent decades as a sign that the end of poverty and extreme inequality is near. And, in many countries relative inequality indicators are suggesting the poor are catching up with the rich. For instance, using a relative inequality measure the World Bank boldly concluded that an era of shared prosperity is already upon us. According to its Global Monitoring Report, the poorest 40 percent fared better than the average in 58 of 86 countries. Yet, a recent paper shows that while the income of the poor may have grown faster, in a number of these countries they captured a smaller share of new income from growth compared to the richest 10 percent. Even more shocking, a recent ODI paper shows that in the past 30 years absolute inequality always increased when countries experienced long periods of growth across income groups. The insights gleaned from comparing relative versus absolute inequality tell us that growth needs to be even more intensively pro-poor than often suggested. In fact, closing the gap between the rich and poor requires the bottom 40 percent to grow around twice the country average. Measuring how the gap between the rich and poor changes over time is an essential first step in addressing inequality. The ODI paper proposes a new measure called the ‘Absolute’ Palma, which is the average income of the top 10 percent minus the average of the bottom 40 percent. This is a modification of the Palma ratio that was first proposed on this blog. As mentioned above, the Palma is a relative measure, calculating the ratio of the share of income of the top 10% to that of the bottom 40%. In contrast, the ‘Absolute Palma’ captures what this means in terms of the actual income gap between the top 10% and bottom 40%. People scoffed at the initial proposal for the Palma ratio, (which was a big improvement on the Gini), but it has caught on rapidly. We think an Absolute Palma would be an even better measure of inequality – let’s hope it catches on just as quickly. The World Bank’s Commission on Global Poverty will release a report this year about measuring progress towards reducing poverty and promoting inclusive growth that is likely to shape the next 15 years of the international development agenda on this aspect of the SDGs. This blog highlights three challenges for the Commission as they think through solutions; to avoid creating perverse incentives, to ensure that countries starting points are taken into account and to combine poverty and inclusive growth in a constructive way. 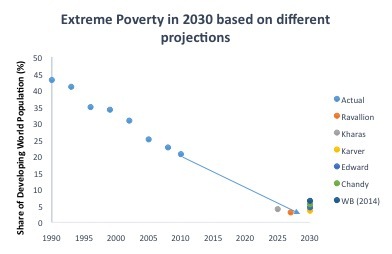 I’m going to illustrate these by drawing on an ODI paper launched today that projects what levels of national poverty (that is, poverty defined by national poverty lines) might look like in 2030. 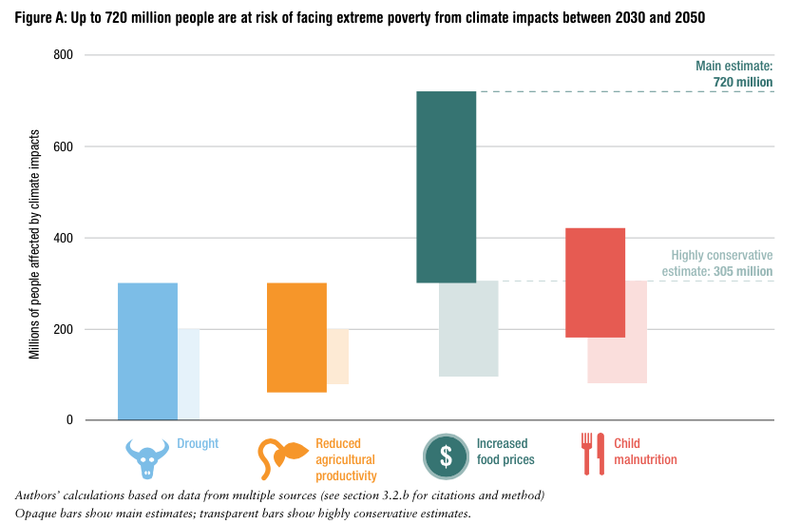 While there have been numerous projections of extreme poverty to 2030, this paper is the first time the same exercise has been done with national poverty. Specifically, the paper looks at the feasibility ofSustainable Development Goal (SDG) target 1.2 to halve national poverty. It shows that the vast majority of developing countries could achieve this target if high growth prevails for the bottom 40% of their population (and national poverty lines don’t change). The way targets to reduce poverty are measured can create perverse political incentives as unlike most indicators in international development, poverty lines are set and updated by the institutions that are aiming to reduce poverty. This is particularly the case for national poverty as there’s little incentive for governments to raise the level of national poverty lines (ie the level of their ambition) if they’re also trying to meet targets to reduce national poverty. If they did so, of course, the government would be increasing the number of people who live in poverty making it harder to reach poverty reduction targets. For example, Indonesia is on track to virtually eliminate national poverty by 2030. Currently only around 10% of Indonesians live below the national poverty line of around $1.10 (2005 PPP), which is one of the lowest in the world. If the national poverty line was consistent with other countries of a similar average income, it would be almost three times higher and two-thirds of the population would live below the national poverty line. As it stands, there is little incentive for the Indonesian government (or that of any other country) to ensure poverty lines truly reflect national realities. Countries should be encouraged to dramatically reduce poverty, however how their progress towards this is measured should not create preserve incentives that allow governments to claim to have made rapid progress even if there has been little change in the standard of living of the poor. Efforts need to be made to ensure countries’ starting points are taken into account when comparing progress in reducing poverty across countries. This is because the current level and depth of poverty in a country is a key factor in determining how likely it is to be able to meet any target to reduce poverty. For example, countries are on a very uneven playing field trying to achieve SDG target 1.2 to halve national poverty by 2030. In some countries, over 60% of the population lives below the national poverty line, while in others that figure is less than 10%. This can be seen in the chart below of current levels of national poverty in 59 developing countries that had recent and reliable data available. How far people live below the national poverty line – the poverty gap – also matters. The target to halve national poverty is significantly more challenging for countries in Latin America and Sub-Saharan Africa where the average poverty gap is around 20% compared to less than 5% in East and South Asia. This means the incomes of the poor need to increase much more in countries in Latin America and Africa compared to in Asia to meet the target. Therefore the target only requires some countries to take relatively small steps while others need to jump substantially higher to meet the same target. Focusing solely on promoting high growth for the bottom 40% of the population is one of the most efficient ways to reduce income poverty and promote inclusive growth. Unfortunately the World Bank and SDG inclusive growth targets do not directly aim for this. They are measured by comparing the average growth rate in a country with the growth rate of the bottom 40%. However if both the average and bottom 40% growth rate in a country are low then achieving inclusive growth targets could have little impact on reducing poverty. The projections of national poverty to 2030 in the ODI paper clearly illustrate the need to prioritise high growth for the bottom 40%. Twice as many countries would be on track to halve national poverty by 2030 if the bottom 40% grows 2 percentage points faster than the average compared to equal growth across the distribution, keeping the overall level of growth constant. 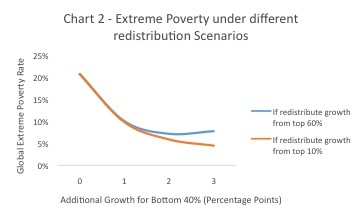 In other words, for the same rate of average growth, huge progress can be made in reducing poverty if the bottom 40% are the main beneficiaries. This can see in the case of India: equal growth across the distribution would leave 18% of its population in national poverty in 2030, whereas if the bottom 40% grow 2 percentage points faster than the average, this could virtually eliminate national poverty. These challenges need to be addressed for the ambition of the SDGs – and the World Bank’s – goals to be realised. Otherwise progress reducing poverty and promoting inclusive growth could be said to be achieved even if there is actually little change in living standards for the poor. What has Christmas shopping got to do with allocating foreign aid? At Christmas time, the furthest thing from your mind when you are shuffling around crowded shops is what all of this has to do with the allocation of foreign aid. But you may be surprised to find that there are several things Christmas shopping can teach us about the way in which such aid is allocated. Obviously, aid is an important issue that should be taken seriously. Nonetheless, ’tis the season to be jolly, so this blog takes a light-hearted look at aid allocation, drawing out four key lessons. Buying a present for someone you know nothing about, who may live a long way away, is a big mistake. You rarely hit the mark and will almost certainly disappoint. The same is true of aid. If donors have little understanding of country context, we should not be surprised that the results are disappointing. At a minimum, donors need in-depth knowledge of the countries in which their aid is being spent and have some staff based in that country (or who at least make regular visits). Avoiding the embarrassment of dramatically underspending or overspending on your loved ones is a must. It’s a relief when you meet their expectations, but getting this right can be tricky – particularly in the early stages of a romantic relationship. It can be really awkward if he buys her expensive jewellery and she buys him cheap socks. In the aid world, meeting expectations is crucial to ensure the best possible outcomes for the beneficiaries of aid programmes. Few things are more disruptive than unreliable or inadequate funding. Yet the aid industry is plagued with this problem. For example, the Australian government has just announced the seventh cut in funding to its aid budget in just over two and a half years, which will lead to the early end or downsizing of many programmes. If you buy people things they don’t need or want, you are wasting your time and resources. We see how common this is after Christmas, when there are long queues of people at the returns counters trying to exchange their unwanted presents. The same can – and sometimes does – happen in the aid and development industry. Often well-meaning initiatives spend large sums of money on things no one actually needs or wants. A classic example has been an initiative to provide t-shirts for Africa. There is little evidence to suggest that there is a massive unmet demand for t-shirts in Africa or that t-shirts actually benefit people a great deal. In response to such initiatives, ‘local ownership’ has become something of a mantra in the aid industry in recent years, whereby the beneficiaries of aid programmes actually have a say in where and how aid is spent – a welcome shift. 4. Don’t buy someone something they would have bought for themselves. When was the last time someone bought you a loaf of bread as a Christmas present? Probably never. Why not? Because you try not to buy something that they will definitely buy for themselves. The best present is something they need, but would have been unlikely to buy for themselves. Donors face a similar but more complicated reality. They should avoid spending aid on things that the governments of developing countries would definitely spend money on themselves, such as politicians’ wages. Not only will this have little or no impact on most of the aims of aid (such as poverty reduction); we can be sure that the recipient government would have certainly spent money on this. Smart aid allocation focuses on areas that are crucial for lasting development but that may not be top priority for recipient country governments or the private sector, such as the provision of basic education and healthcare to those who would otherwise be left behind. I hope these four lessons come in handy if you too are finishing your shopping in the coming days. And my biggest hope is that the aid industry keeps these lessons in mind!